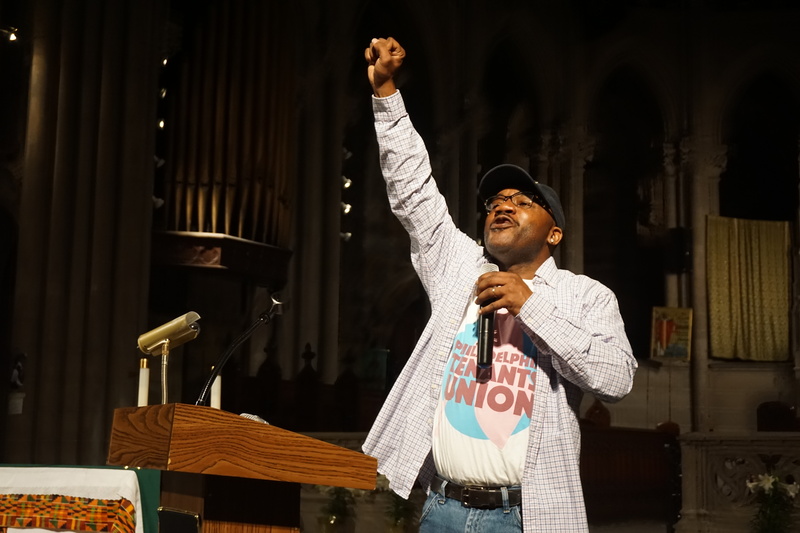 Image caption: Philadelphia Tenants Union Vice President Barry Thompson has his fist raised in the air as he speaks into the microphone. In 2015, Philly Socialists began its campaign for a citywide tenants’ union. In 2016, the Philadelphia Tenants Union had its founding convention at the Church of the Advocate, where it announced its commitment to building independent tenant power, with the pursuit of “Good Cause” eviction protections as its primary reform agenda. On April 11th, the PTU returned to the Church of the Advocate to rally for Good Cause eviction protections. For those on the radical Left, this seems like a minimum set of reforms. PTU members agree — and this is just their first step. Good Cause eviction protections represent the legal foundation to enforce other affordable housing reforms like rent control. Even if Philadelphia had rent control, currently, a landlord could simply evict tenants in rent-controlled units for no reason and then raise rents for new tenants. Similarly, tenants cannot effectively defend their rights if a landlord can later reject a lease renewal for no reason. While Good Cause protections are not the ceiling of the affordable housing fight, it is part of the foundation for a long-term struggle to win affordable housing. At the rally, speeches came from PTU members and City Council member Curtis Jones (the primary sponsor of the Good Cause bill). Organizers provided free food to the 50 attendees at the rally, and the Strawberry Mansion High School Drumline provided the entertainment. Gentrification is social cleansing1 — and evictions and rising rents are its primary tools. However, this rally and fight is not just about passing a single reform, it is about building an organization that is capable of winning future reforms, defending current reforms, and accountable to tenants, not City Council. Some supporters of Good Cause, such as the city’s Community Legal Services, have provided crucial legal support and advice. But the PTU has organized the lobbying days, filled City Hall, outlined the strategy to target specific city council members, produced its own branding, led the social media campaigns, continued to take on individual tenant fights and lift up tenant leaders, and organized local unions, community associations, and nonprofits into a sponsoring coalition. Moreover, the PTU continues to carry on organizing tenants into an independent political base, through its advocacy for individual tenants and organizing tenants in buildings at risk of mass eviction. Through this entire struggle, the PTU has positioned itself as the most powerful voice from the grassroots. This was made possible by years of building long-term trust-based relationships between the PTU and tenants. This work is not easy, but shouting from the rafters and activist networking will never deliver the goods. It is time the Left regain its position as the most credible voice of reform and a trustworthy community partner. Want to help? Come out to City Hall when City Council decides on the final date of the vote! Stay tuned by following the PTU and Good Cause Facebook pages, or by signing up for the Philly Socialists email list! 1 The process by which marginalized communities are destroyed and their members tossed from and forgotten by the rest of society.